This weekend I headed up the AV team for two big events. It was certainly a big weekend for the whole team. 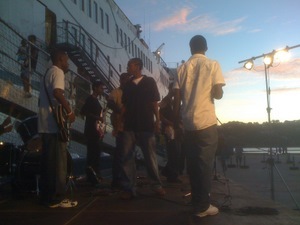 The first event was a 3 hour epic youth event featuring a local band and a number of vocal acts from a UK Hip Hop group that is visiting the ship. I headed a team of 9 people: Sound, Backstage, Lyrics, Lights, Spotlight, 3 camera operators and a video switcher. Everyone did a fantastic job and we created a fantastic atmosphere. The message was ‘Reach for Life’ motivating young people in St. Lucia to make good life choices and to give their lives to Christ. There was a drama that demonstrated that you can’t sit on the fence, you must choose Jesus or Satan. At the end of the event, 20 youths gave their lives to Christ, and that’s what it’s all about. The very next day the AV team got to work bringing the quayside stage out to entertain the innumerable visitors waiting in line to get into the book fair. 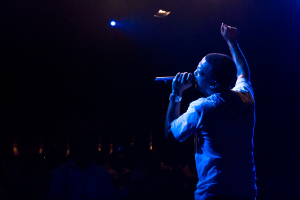 The UK artists sang up a storm and a number of local youths stepped out of the queue to listen and cheer. The next day a local band came to play and entertain guests. They were a fantastic worship band that everyone liked. The plan was to have testimonies and dramas and puppets and all sorts of different ways of communicating the gospel. Unfortunately a huge storm cloud came overhead and it poured down rain. I rushed to cover everything and a number of people helped out. I was completely soaked but nothing was water damaged. It was a good opportunity for me to test out a new sound system that I built the previous week from left over gear, and people really enjoyed the show while it lasted. The classroom was hot and dirty and nearly a hundred high school students had packed into the room to listen to what I was about to say. I had nothing written down to help me, but I had remembered a song with all the information about the ship. I had their full attention and without a microphone I managed to project my voice in order to tell them all about the ship, it’s people and it’s purpose in five minutes. I was part of a team of five from the ship who visited a local high school to present a one hour gospel program. One person shared their testimony and one gave a sermon. Others played some songs and I played a part in a drama. 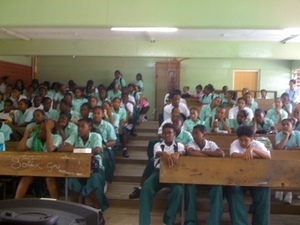 The students were very interested in what we had to say and many came to talk to us afterwards. Some appeared to be very touched by the message we gave. I also had the opportunity to chat with one of the students before the program and paint a picture of having a relationship with Jesus. It was a short conversation but I think I may have planted a seed at least. 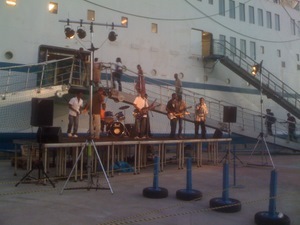 Later in the week we had the opportunity to provide an all day program for people waiting in line to get onto the ship. We put a stage up outside the day before with some help. On the day we hauled all the speakers and sound equipment from the store room to the quayside. It took us half the day to figure out how everything connected together but it was very worthwhile when we had it all together. There were mimes, jesters, dances, dramas, testimonies and more happening on the stage and the people in line really enjoyed it.